Tom Brady's return has restored a sense of normalcy to the New England Patriots. 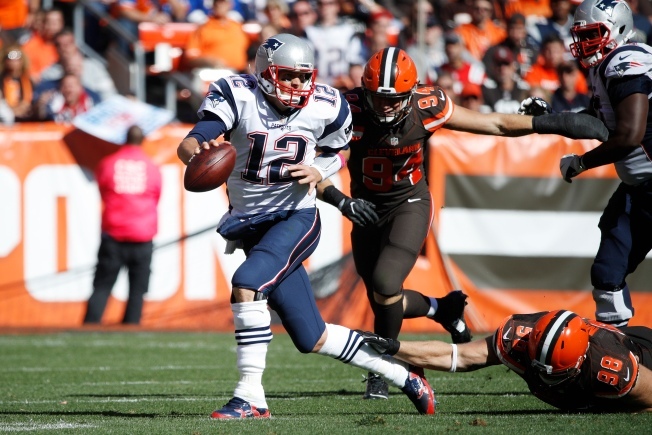 Brady triumphantly re-emerged from his four-game "Deflategate" suspension with a 406-yard, three-touchdown effort in Sunday's 33-13 win over the Cleveland Browns, and his performance earned him the honor of being named the AFC's Offensive Player of the Week on Wednesday. "All is well now that 12's back," wide receiver and special teams captain Matthew Slater said Monday. But in typical Patriots fashion, they're shifting their focus to next week's opponent. Only this time they won't have to answer questions about life without Brady. "I guess one could say that (it's back to normal)," Slater said. "It felt as normal as it could be the first four weeks, but we tried to just continue to approach our craft the same way regardless of the circumstances." The Patriots went 3-1 in Brady's absence with a combination of third-year backup Jimmy Garoppolo and rookie Jacoby Brissett handling the snaps under center. Their only defeat was a stinging 16-0 loss to division rival Buffalo at Gillette Stadium in Week 4, marking the first time New England was shutout at home since 1993. "The way we performed against the Bills was very disappointing for everybody in this locker room," Slater said. "So to come out and get that bad taste out of our mouth and obviously get Tom and Rob (Ninkovich) back, it was a good day for us." Ninkovich also sat out the team's first four games for violating the NFL's policy on performance-enhancing substances. He made one tackle in his first game back against the Browns. The returns of Brady and Ninkovich covered up another concerning day for kicker Stephen Gostkowski, who missed a field goal for the third time in four games. Gostkowski missed a 50-yard attempt Sunday, but he did make a 31-yarder. He missed his only attempt against Buffalo and was off target from 39 yards in Week 2 against Miami. Nevertheless, the Patriots still have confidence in the franchise's career leading scorer. "Stephen's one of our hardest-working players and I'd say one of the most respected players on the team because of the way he does work and how team-oriented he is," coach Bill Belichick said on a conference call Monday. A more consistent performance from the 11-year veteran would help take pressure off Brady in his first home game back against the Cincinnati Bengals on Sunday. Of course, it seems as if the stage has never been too big for the 39-year-old quarterback. "Old Benjamin Button hasn't slowed down yet," Slater said. NOTES: Patriots players took pictures in front of Jim Brown's statue after Sunday's game in Cleveland. "He did a lot for the game of football, but he did a lot for black athletes," Slater said. "I feel like because of men like him that I have the opportunities that I have today as a professional athlete in America." Belichick met Brown during his tenure as the Browns coach from 1991 to 1995. "I think honestly any person, football player or otherwise, can learn a lot from Jim Brown and what he represents and what he stands for," Belichick said, adding that he believes Brown is "the greatest player that ever played."